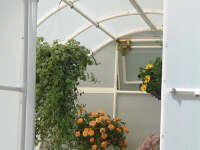 The most economical insulated greenhouse kit on the market! 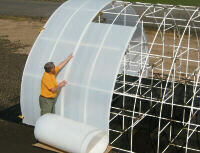 Easily move the Early Bloomer Greenhouse throughout your yard to the most desirable location for each season. Great for tall plants or small trees, the 6'3" height of the Early Bloomer greenhouse gives you plenty of room to grow. Start your garden right in the greenhouse and get an early start on planting seeds and an extended harvest in the fall. 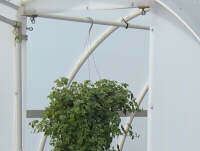 The structure is sturdy enough to withstand strong winds and the steel-reinforced hanging rods enable you to overwinter your prized hanging baskets. A large vent is included to maintain plenty of air circulation for healthy plants. And best of all, it's covered with Solexx XP panels to increase heat retention and provide optimal diffused light. Strong and shatter-proof, double-walled Solexx panels will protect your seedlings and plants from strong winds, hail, driving rain, snow, and other harsh weather conditions. With our insulated Solexx panels, you will keep heating costs low while extending your growing season from early spring to late fall. Unlike other greenhouse coverings, our double UV inhibitor is added as the plastic is processed, and is not just a coating. Solexx panels create an evenly diffused light so no matter where your plant is in the greenhouse, it will benefit from optimal growing conditions. Free Delivery in the contiguous 48 states! Strong, shatter-proof Solexx panels stand up to wind, hail, and snow and are backed by an 8-year warranty for your peace of mind. The twin-wall panels create an evenly diffused light for optimal plant growth, plus they are insulated to help keep your heating costs low. 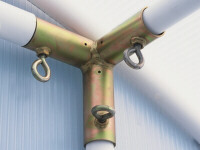 The anodized steel fittings throughout all Solexx Greenhouses offer superior strength and fast assembly. Just insert the pre-cut, color-coded frame pieces and tighten down the eye bolts.